Next to Christmas, New Year's Day is the second most celebrated holiday in the Philippines. We, Filipinos make lots of preparations for it, and there are some traditions that we follow in the belief of ushering in a prosperous New Year. We literally celebrate this day with a BIG bang! At the strike of 12:00 midnight, you can hear church bells ringing, firecrackers banging and booming everywhere, children making sounds with their torotot (horns), car horns tooting and empty cans dragged all around. These things are done to make lots of noise which is believed to scare away evil spirits. After all the noise making, a midnight meal called Media Noche is shared with family members. This feast symbolizes family union and celebration. It is believe that when we put lots of food on the table, we will have food all year round. I grew up practicing these things, and I have always loved the sight of fireworks display and abundant food as we welcome the new year. 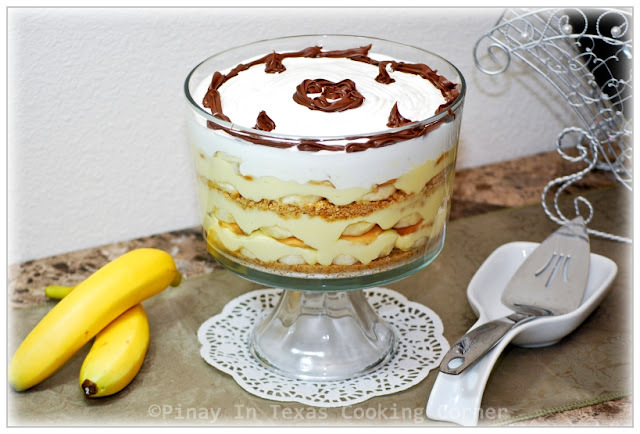 I want to end 2011 with this Banana Cream Trifle - a very simple yet beautiful and truly delicious dessert that my family and I love so much. There's no cooking involved and can be easily whipped up in minutes, so this is perfect for any occasion! 1. 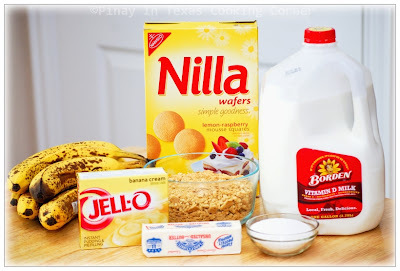 Prepare the pudding mix as directed on the package using 3 cups milk. Set aside. 2. 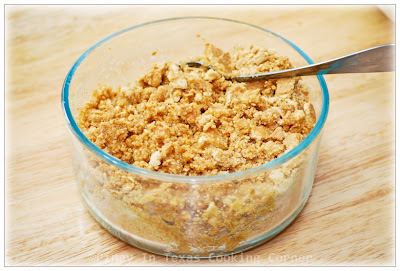 In a bowl, mix graham cracker crumbs, sugar and butter until well combined. 3. Press half of the mixture firmly into the bottom of the trifle bowl. 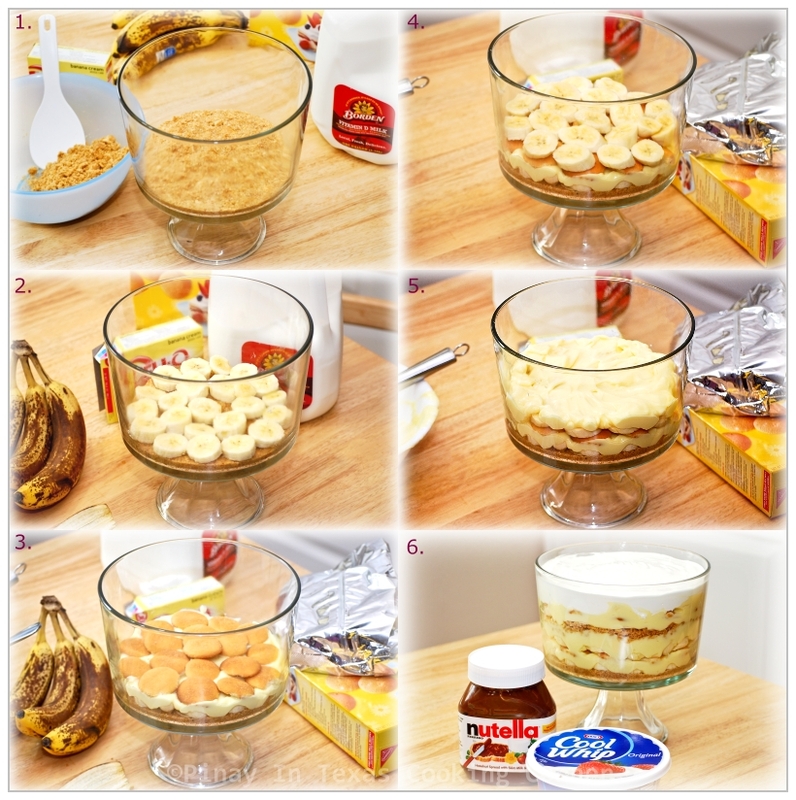 Layer the bananas, Nilla Wafers and banana cream pudding as you wish. I did the layering as follows: 1/4 of the sliced bananas then 1/4 of pudding then 1/2 of Nilla wafers then another 1/4 of bananas then another 1/4 of pudding. Add the other half of graham crumbs mixture. Repeat layers then top with cool whip, and decorate with nutella. I remember during my younger days, its about all dressed up and hitting the clubs for New Year, party and drink like mad before coming home totally exhausted. Well, I have passed this long time ago and now its a quite one with my hubby with a glass of wine, chatting and recalling what the year has been with being together for so long. Anything with bananas I will drool and so the same with this truffle you have made, looks very tempting but since I am not a dessert person, I will be satisfied with just a spoon full of it. Happy New Year to you and everyone at home and god bless. This looks amazing! We had so many good things to eat over the Christmas season. I'll now add this to my list for next year. I know everyone will love it! That's a beautiful trifle! So glad to have met you on this food blogging journey. Wishing you and yours a very Happy New Year! Love the layers of flavors here. Trifles do make for some stunning desserts, yours looks amazing. Great idea, relaxing on Jan 1-I know we all deserve some relaxation from the kitchen once in a while. I wish you a wonderful 2012 and I am glad you are a part of this great community of bloggers! I always run out of steam by the time new year's eve comes so this dessert is just perfect. It is rather quiet here in London as well, very unlike what we have in Manila. I wish you and your family happiness, health and good fortune in the coming year, Tina! Ohhh..I love bananas! This left my mouth watering.. I hope you have a wonderful New Year! Cheers to good food and friends! Oh, what a delicious way to usher in the new year!!! Wishing you many blessings in 2012, my friend!! Just stopping by to wish you and your family a Happy, Joyful and Healthy New Year. May 2012 bring all the you desire and more. As always, your recipe is wonderful. That looks and sounds amazing. 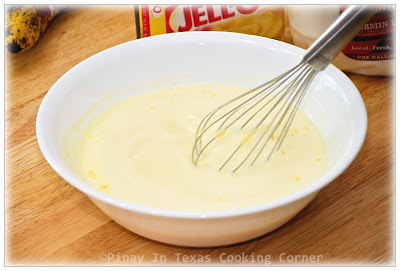 The triffle is very impressive and looks very easy to make! I wish to you and your family a Very Happy and Prosperous New Year! 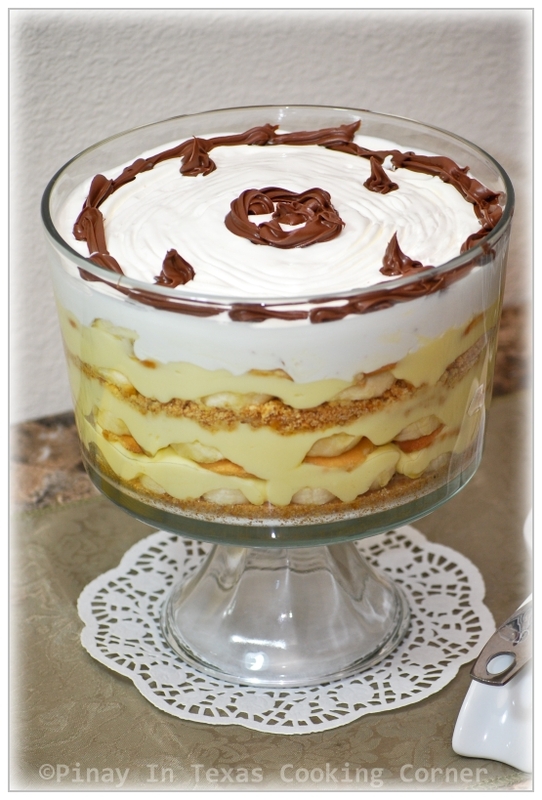 What a gorgeous-looking trifle, Tina! Been a pleasure connecting with u & hope to see u more often! Happy 2012! 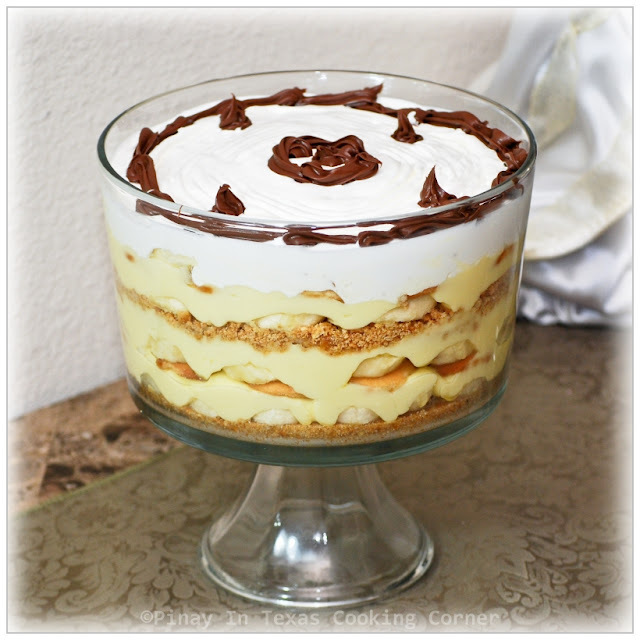 The Nutella in this trifle is AMAZING! Happy New Year my friend! and HUGS! Thanks so much for all the new year greetings! Wishing you all a blessed and joyous 2012!